Using the right tools, you can create an application from scratch and release it to production very quickly. In this post, I will show you how to develop a task list application, with Angular, that consumes a serverless REST API and persists data to a MongoDB database hosted by mLab. This application will also focus on security, with Auth0, and will be deployed to GitHub Pages. "Learn how create a serverless fullstack SPA with Angular, Express, Mongo GitHub Pages." Since the app that we are going to develop is quite simple in terms of features, it won't be necessary to have MongoDB running on our local environment. We will use mLab during development as well as production. The only tools that are expected to be installed are NodeJS and NPM. We are going to create our new Angular app with Angular CLI. Actually, we will be using this tool during the whole process to create components/services and build our app for production. The last command is responsible for packaging our application with the development profile, and for serving it locally with Webpack Development Server. After executing all these commands, navigate to http://localhost:4200/ to see it up and running. The first thing that we are going to take care of in our application is security. Security must be a first priority in any application that handles sensitive, third party data like the task list that we are about to develop. To start, sign up for a free Auth0 account and take note of Client ID and Domain. Both values are going to be used to configure Lock: an embeddable login system. Important: Auth0 requires a list of Allowed Callback URLs. This list contains all the URLs to which Auth0 can redirect a user to after issuing a JWT. Therefore we must configure at least two URLs: http://localhost:4200/ and the URL where our app will be exposed, something like: https://brunokrebs.github.io/task-list/. This URL will be defined when we release to GitHub Pages. Let's use Angular CLI to create a NavBarComponent. This component will have Sign in and Sign out buttons. We will also create a AuthService that will be responsible for sign in, sign out and to validate if the user is authenticated or not. In the code above, there are three things that worth mentioning. First, we must replace AUTH0_CLIENT_ID and AUTH0_DOMAIN with the values that we noted previously. Second, the ID_TOKEN references the key were the JWT will be saved (on the user's browser localStorage). And third, the constructor of this service adds a callback listener to the authenticated event on Lock. This callback saves the token issued by Auth0 in localStorage. To sign out a user, it is just a matter of removing this token from localStorage. We can now focus on implementing our NavBarComponent. First, we will inject AuthService and add three public methods that will be used by our HTML interface. Then we will implement the interface and add some CSS rules to improve it. Good, we now have both the NavBarComponent and the AuthService fully implemented and integrated. But we still need to add this component to our src/app/app.component.html file, otherwise it will never get rendered. To do this, just replace the content of this file with the following line of code: <app-nav-bar></app-nav-bar>. We are now good to go, so let's start our development server, by issuing ng serve, and head to http://localhost:4200 to look how things are. You can even sign in and sign out, although there won't be much to see. Please <a>sign in</a> to manage your task list. Heading to our app, http://localhost:4200/, we can see our new welcome message (if we are not authenticated). Now that we have our application integrated with Auth0, which allows our users to sign in and sign out, let's create our serverless REST API. This API will handle POST requests (to persist new tasks), GET requests (to retrieve tasks from a user) and DELETE requests (to remove tasks). The code is quite simple and easy to understand, but an overall explanation might come in handy. The main purpose of this file is to export an Express app that handles three HTTP methods for a single route, the main / route. These three methods, as explained before, allow users to create, retrieve and delete tasks from collections on a MongoDB database. Every user will have their own collection—not the best approach, since MongoDB can handle a maximum of 24,000 collections, but good enough to start. This collection is based on the sub claim, which identifies user, present in the JWT issued by Auth0. The last function definition in the tasks.js file, loadUserCollection, is actually responsible for two things: security and MongoDB connection. When a user issues any request to our API, the function verifies if the authorization header sent was actually signed by Auth0. If none is sent, a non-user-friendly error is generated. This is done through the jwt.verify function with the help if AUTH0_SECRET key. The second responsibility, connecting to MongoDB, is handled by the mongojs module and depends on three configuration variables: MONGO_USER, MONGO_PASSWORD, MONGO_URL. All these configuration variables—three to connect to MongoDB and one to verify Auth0 tokens—are passed to Webtask when creating the serverless function. We will see how this is done soon. This is the whole REST API implementation, with this code we are ready to handle users requests that will be sent by the components that we are about to create on our Angular app. But there are a few more steps that we need to perform. 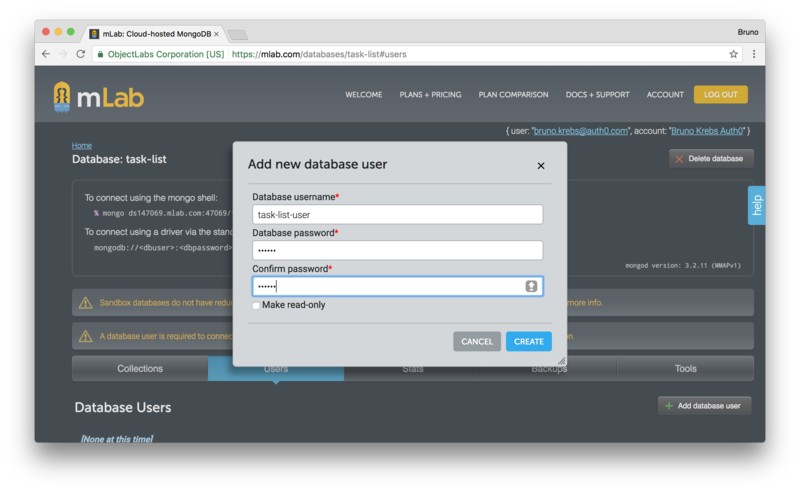 To make our lives easier and to avoid heaving to install and support MongoDB by ourselves, we are going to use mLab, a cloud-hosted MongoDB. The first thing that we have to do is to head to their website and sign up for a free account. After verifying our email address, we have to create a new deployment. Since we are just starting our app and we won't get too much traffic, let's choose the Single Node plan and the Sandbox type, which provides us 500 MB of DB storage for free. You will also need to type a database name, choose something like task-list. The last thing that we will have to do is to create a user to connect to this database. If you choose task-list as the name of your database, this is the link to create users. We will also need to create a Webtask account, but this as easy as it can be. Webtask, being a product of Auth0, relies on Lock and enables us to create an account with one of the following identity providers (IdP): Facebook, GitHub, Google or Microsoft. It is just a matter of hitting a button to create an account. You will be asked to enter the verification code that was sent to your email address. This is the final step in the Webtask account configuration. The first option passed to the wt tool specifies that we want to create a Webtask based on our webtask/tasks.js file. The second parameter identifies our code as being an Express app, which needs to be pre-compiled by Webtask with the help of webtask-tools/express tool. The following four parameters are the secrets that we use in our Webtask (-s prefix denotes them as secrets). The last parameter creates our Webtask in production mode, which makes it faster. Be aware that the values above have to be replaced with values that come from our Auth0 account and from our mLab account. AUTH0_SECRET value can be found at the same place of Client ID and Domain. And the last three values, related to MongoDB, can be found at mLab's dashboard. Having successfully issued the Webtask creation command, we can now focus on working on the main feature of our Angular application, the task list component. Both TaskListComponent and TaskFormComponent will depend on TaskListService to communicate with our serverless REST API, so let's handle the service implementation first. There are three important things to note in this code. First, the TASKS_ENDPOINT constant. This constant must reference the URL returned by the wt create command above. Second, this class is not using Http from @angular/http. 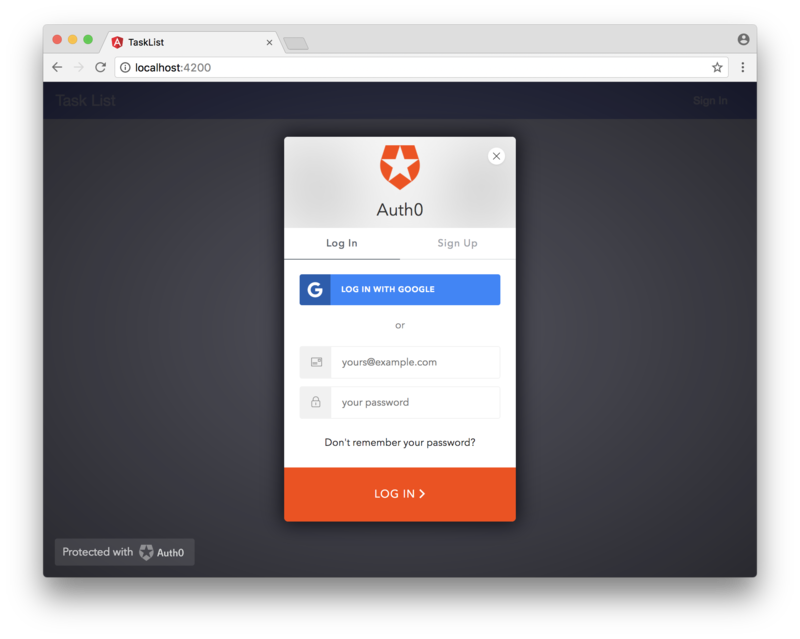 It is using AuthHttp, which is provided by angular2-jwt and which integrates gracefully with auth0-lock. Instances of this class automatically send an authorization header with whatever content it finds on id_token key on the user browser localStorage. As you may have noted, this is the same place where we stored tokens when configuring AuthService. Third, all methods in TaskListService return Observables, leaving the caller to decide what to do with the response sent by our serverless REST API. The first change that we made to our module was to add TaskListService as a provider, just like we did before with AuthService. The second change also added a provider, but in a more complex form. The AuthHttp provider needed help from a factory - declared as authHttpFactory - to be created. This factory has Http and RequestOptions as dependencies, so we needed to define the provider as a literal object, passing this dependencies explicitly. This class gets TaskListService injected and add a few callback methods to the Observables responses. Both taskAdded$ and deleteTask$ triggers a call to loadTasks method when the Observables respond without errors. console.log is triggered by these methods to handle cases where errors are issued by the serverless REST API. The loadTasks method calls taskListService.loadTasks$ to assign the result to tasks property. With the three exposed methods and the task property filled, we can now implement the TaskListComponent interface, which resides in the src/app/task-list/task-list.component.html file. Here we added a md-list component, provided by Angular Material, that iterates through the tasks, showing their creation date and their description. Also, each task got a button that enables users to delete them. This will make different tasks distinguishable with a gray background color, and push the delete button to the right, aligning it vertically to the task. If we open our application in a browser, by accessing http://localhost:4200, we would see the following screen. Our app's completion now depends on implementing the last component, TaskFormComponent, to allow users to add tasks to their lists. When clicked, the Add button triggers the addTask method in the component. This method then triggers the taskAdded event emitter. TaskListComponent is the component that will listen to these events. We already implemented a method, called taskAdded, that can handle such events. We just need to update this component's HTML to add TaskFormComponent and register the event handler. And here we go. Our app is now fully implemented and ready to go to production. Or is it? If we play a little with the application we will see that under some conditions the user experience is not that good. The app takes a while to update the task list when a new task is added or an existing one gets deleted. So there is room for improvement. Here we have create both event emitters and have added them to the three methods that depend on AJAX request. Whenever one of these methods gets called we emit an event, through this.startAjaxRequest.emit(), to make the Slim Loading Bar start running the loading bar indicator. After getting a response back from the AJAX requests sent by the loadTasks method, that updates the task list, we tell Slim Loading Bar to complete its progress through this.completeAjaxRequest.emit(). That is exactly what GitHub Pages provides. To use it is simple. We just need to create a repository and push our work to a branch called gh-pages. This branch should contain only our production bundles. To create a GitHub repository go to GitHub, sign in (or sign up if you don't have an account) and choose the Create a New Repository option. Create your new repository naming it as task-list. Note that if you choose another name, you will have to adjust the base-href parament of the ng build command that we will run later. git commit -m "Task List Angular app with a secure serverless REST API." Having our code safe, we can now work on the going live task. Two steps are needed here. The first one is to prepare our code for production and package it. Again Angular CLI comes in handy. To do that we just have to issue ng build --prod --base-href=/task-list/. Note that we have to set base-href to the exact same name of our GitHub repository, otherwise our application won't be able to load all the resources and it won't work. The second step used to be handled by Angular CLI, but this command has been removed in the latest release, so we will need a third party tool to help us here. Fortunately, there is one that is very easy to use called angular-cli-ghpages. To install it issue npm install -g angular-cli-ghpages. After that we just have to execute angular-cli-ghpages (yep, without any parameters) and voilà. Our app is up and running on GitHub Pages. Important: do not forget to update the Allowed Callback URLs on your Auth0 account. The list of allowed URLs must have the URL where our app was exposed. This should be something like https://brunokrebs.github.io/task-list/. "GitHub pages is a great place to host your SPAs." As we could see, when we choose the right tools, it gets easy to achieve great accomplishments. We started with nothing, just an idea to develop a task list application, and managed to create and release it to the internet with not that much effort. We didn't even have to worry about building, supporting and securing servers to host our web application or our database. If we had to manage these tasks by ourselves, we would take much more time and wouldn't be as confident about our app's security, fault tolerance and scalability. And this is just the beginning. Freeing ourselves from all these issues enables us to focus 100% on our ideas and on what makes our applications unique.